ALL RESERVATIONS are only taken by phoning us on 403 352 8801. Reservations are available all year round but especially recommended between April 1st and Sept 30th. Customers may reserve for the Campground, up to 6 months in advance. (See conditions below.) ALL RESERVATIONS incur a non-refundable $10 plus GST fee. A Cancellation fee of $12.00 plus GST applies if a reservation is cancelled within 3 days of the reserved date. The reservation fee of $10.00 plus GST is non-refundable. Reservations can be accepted for the Watchtower Conventions in June of each year, up to 12 months in advance. All pre-bookings will be contacted in January or February of the following year to complete the Reservation. Customers must reserve at least 4 nights for this event to qualify for the Campground. Space in the Campground is limited, however, so book early. If reserving the Overflow for this event, a minimum of 3 nights must be booked.. All Customers reserving for this event must pay for the reservation in full, plus the Reservation fee. Reservations can be accepted for the Gospel event in July of each year, up to 12 months in advance. All pre-bookings will be contacted in February of the following year in order to complete the Reservation. Customers must reserve at least 4 nights for this event to qualify for the Campground. Space in the Campground is limited, however, so book early. If reserving the Overflow area for this event, a minimum of 3 nights must be booked. All Customers reserving for the Gospel Event must pay for the reservation in full, plus the Reservation fee. c) SUPER RUN - August Long Weekend - every 3 years. All reservations for the above events are payable in advance. For all long weekends, a minimum of 3 nights' reservations is required, payable in advance. For all other weekends, a minimum of 2 nights' reservations is required, payable in advance. Reservations during the week for 2 nights, are payable in advance. For Reservations during the week for 3 nights or more, we will accept a minimum deposit of $50.00. For any one night stay, we do not accept reservations, vacant sites will be allotted on a first-come-first-serve basis. No Reservation fee applies in these cases. The Westerner Campground is usually fully reserved for most weekends of the Spring/Summer/Fall seasons, so reservations are highly recommended for this period. Long term reservations throughout the year, on a 28 day cycle basis, can be arranged for those customers requiring other than short term stays at the Campground. There are 38 fully winterized sites, 13 of which have 50 amp power hookup available. For those who do not need water hook up during the winter months, further sites can be made available for long term reservations. Sites for long term customers can be reserved with a non refundable $50 holding deposit. (Refer above for the 28 day rates.) 28 day rentals must be paid in full in advance on the due date to qualify for the 28 day rate. 28 day rentals are non-transferable. 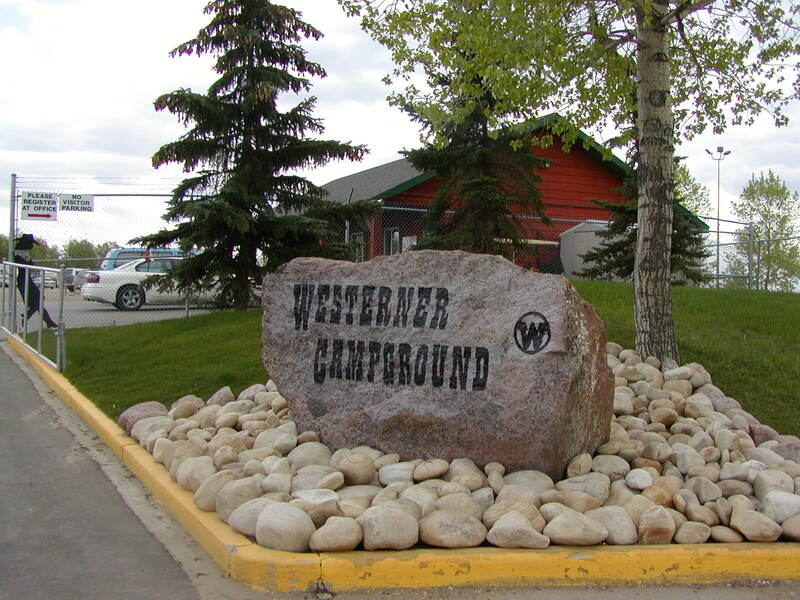 Whenever the Campground is fully reserved, overflow camping (15 amp power only) for RV's is available in the Westerner Park grounds at $26 plus GST a night for all sites plus the Reservation fee of $10 plus GST if the Overflow is pre-reserved. The Overflow is only able to be pre-reserved for the Watchtower and Gospel events in June and July. Otherwise, the Overflow is not available for pre-booking and operates on a first come, first serve basis. Specific sites cannot be guaranteed or held for others. The Overflow has washrooms and showers, (token operated), plus a sani dump with draining facilities and a water fill. 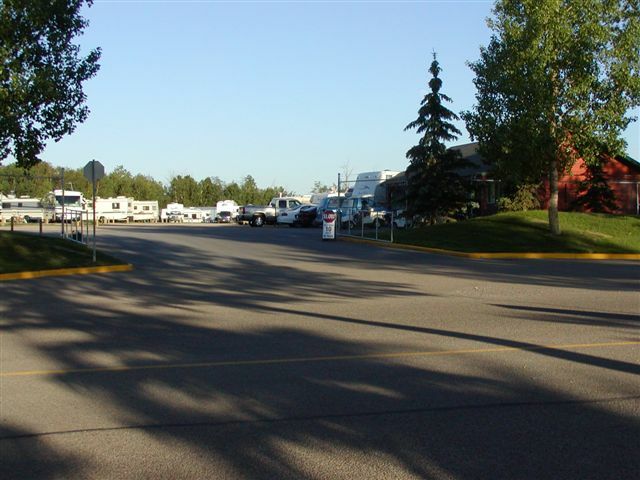 Campers in the Overflow must pay at the Campground Office immediately upon checking in, to obtain the necessary passes for display on their RV and towing vehicle.